Rishikesh Yog Mandir offers one of the most renowned 300 hour yoga teacher training courses in Goa, India. Our course curriculum is designed in away to help the students get a detailed study on every aspect related to yoga. It is not very surprising that many yoga instructors and practitioners these days feel that a 200 hour yoga teacher training in Goa is not enough for their studies and teaching. This curiosity as well the desire to either deepen one’s practice and knowledge to enhance one’s teaching ability and depth are some of the reasons that many teachers feel compelled to embark upon our 300 hour yoga teacher training in Goa. A 300 hour yoga teaching programme will allow you to begin delving into the more subtle and philosophical aspects of this ancient form of practice. A 300 hour yoga teacher training program in Goa will allow you to explore pranayama and meditation techniques as well as the philosophical underpinnings of yoga that will help you to progress on your journey towards Samadhi. The main aim of our advanced 300 hour yoga ttc in Goa is to help all the yoga enthusiasts make a career in the glorious field of yoga. The people who have completed the 200 hour yoga teacher training are eligible for pursuing the 300 hour yoga course at our yoga center in Goa. Where the 200 hour course is based on the fundamentals or mainly meant for the beginners, the 300 hour course is certainly a level up. Here, at Rishikesh Yog Mandir, the students are taught about the higher principles of yoga and meditation as well as the various philosophies. Through our program, you will get to know the infinite possibilities associated with yoga. We are known for providing the 300 hour yoga course at an affordable course fee. After the completion of the course, you will get an International certification in 300 hour yoga teacher training program. We comprise of knowledgeable and highly experienced yoga instructors. One of the most distinguishing factors about our 300 hour yoga course in Goa is that we maintain a small batch size so that the yoga instructor can pay attention to each and every student properly. The students are provided with rooms with high-end facilities. During the stay, we provide our students with pure vegetarian food with tea. The 300 hour yoga course is open for all. A beginner can also join our 300 hour yoga teacher training in Goa. Our 300 hour course will help the students to adopt the yogic lifestyle in his/her daily life more effectively. 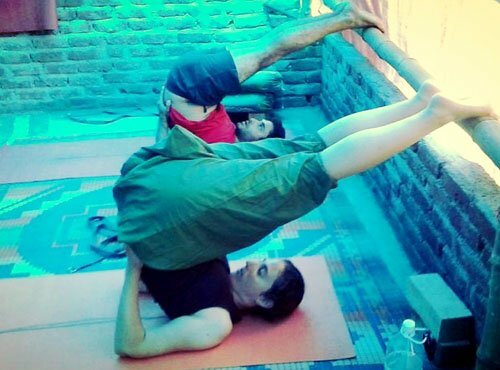 The 300 hour yoga teacher training India offered by Rishikesh Yog Mandir empowers the seekers with the skills and techniques that guide them to practice as well as teach the advanced yoga asanas to others with efficiency and perfection. This teaching experience obtained by the student here will help them to become a role model to hundreds of people in days to come. So practice yoga regularly with dedication and concentration and become an ideal yoga teacher. To book your seat , you are required to fill this application form and send it to us.Call +91 7017276754 or send an email at rishikeshyogmandir[at]gmail.com for any queries.